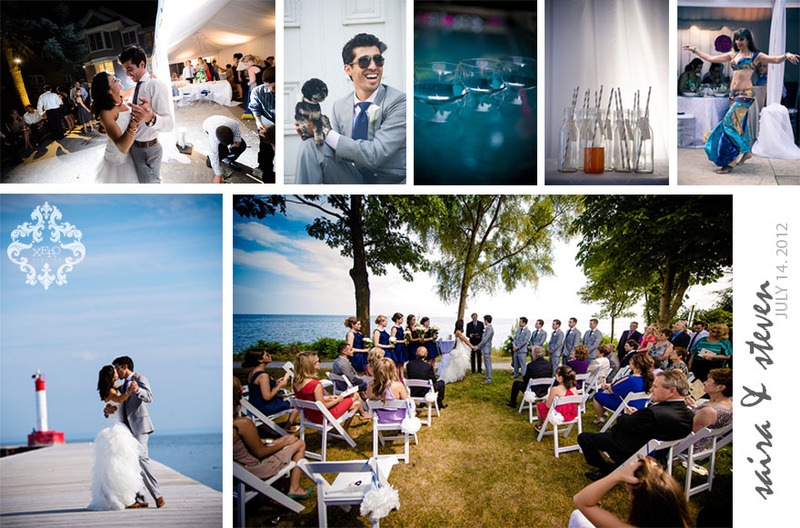 After over a decade of being in business as a Toronto wedding photography company we have had the opportunity to experience and share in countless weddings around the country and the world. I strongly believe that a wedding should reflect the bride & groom’s interests, personalities, backgrounds and of course their personal taste when it comes to décor, ceremony & vows, the reception location and even down to the food choices, flowers and outfits. I would like to showcase a few of the wonderfully creative, unique and differently styled weddings we were able to be a part of through the 2012 wedding season, I feel like these 4 couples really embraced their own personal style and did things exactly the way they had envisioned and dreamed about. I have chosen these weddings based on their unique décor & venue choices, creative receptions and interesting photo shoot locations. Thanks for having us as a part of your special day and for creating such a unique environment and lots of fun details to shoot! Saira & Steven were married in July in Oakville at Saira’s father’s home. The house was steps from the edge of the water, and they arranged to have the ceremony overlooking the water. It was one of the hottest days of the summer, so thankfully we headed down to the pier for some bridal party photos, the reception began immediately after our arrival back at the house where they had put up large tents, and the couple even built a stage for the band over the pool! Saira & Steven kept such an attention to detail, with live music, a belly dancer, beautiful speeches, the decor (and thankfully Steven installed fans in the tents the day before) and lots of Greek dancing into the early hours of the morning! Chelsea and Bob have such an amazing and fun personality, this is the second time they are featured on our blog, have a look at their engagement shoot! They were married on Sue Ann Staff Winery grounds in Jordan, they lucked out and had perfect weather. They had a beautiful ceremony outside in the sunshine and held their reception in a massive tent, even fit with a chandelier!! Chelsea & Bob are such characters, as they should be seeing as they are both in theatre, this played through into their hilarious dancing, awesome wedding day outfits, and even the bridesmaids peacock feathered bouquets. This wedding was a blast and so much fun to be a part of! Chelsea & Andrew had a rustic wedding at Belcroft Estates in Gilford, ON they were all set up in an old barn with lots of natural light, which made our job of capturing their excellent first dance, their rustic cake with initials carved into it, and the beautiful tablescapes! Burlap was used throughout the wedding to tie this rustic wedding together, from the seating chart, Chelsea’s bouquet to the ring bearer’s pillow, it complimented the crates, doors and tables in the old barn. Andrew and his groomsmen prepared for the day in the “Man Cave”, Belcroft Estates set the boys up in an old garage with vintage signs and awesome cars, a serious Man Cave if you ask me! 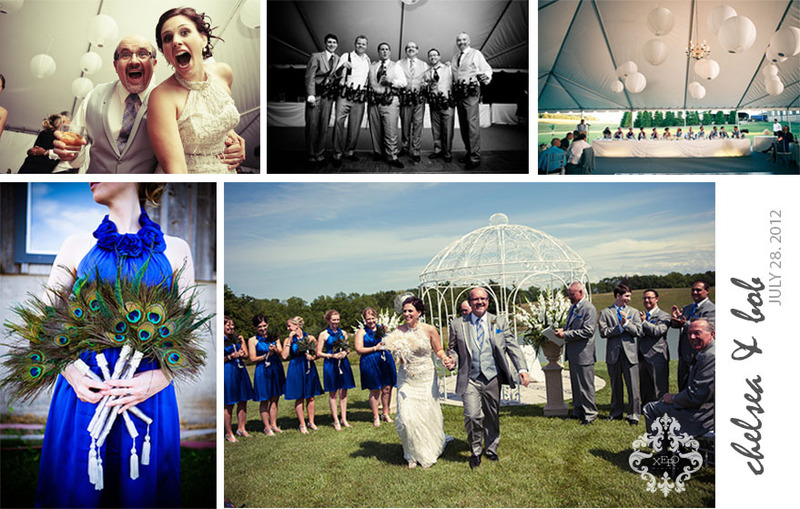 We always love a great barn wedding, and Chelsea & Andrew sure knew how to rock it! 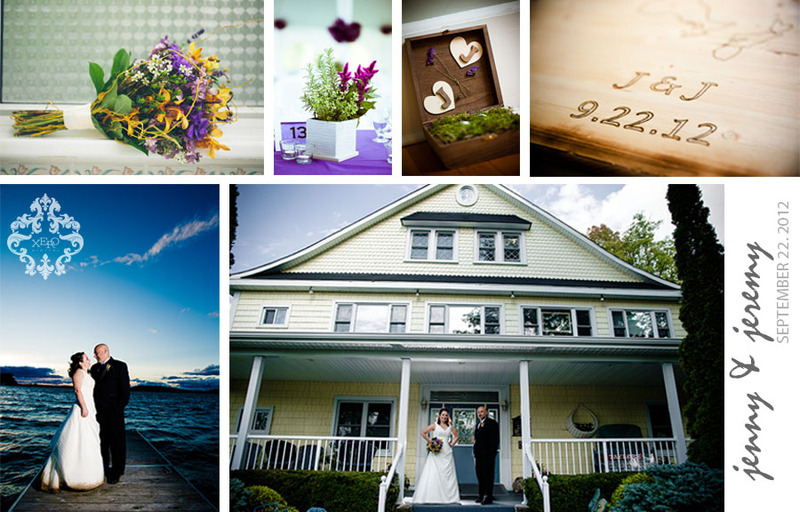 Jenny & Jeremy were married in September 2012 in Gore’s Landing, ON on Rice Lake (north of Cobourg). They had spent several weekends on this lake throughout their relationship, so it was only fitting that they would decide to be married at Victoria Inn right on the lake. They both got ready in this 100 year old Inn, alongside family & friends, oh and the cats that live at the inn! They said their vows and “I do’s” outside with all their guests standing around them, the reception started immediately after that in a huge tent filled with unique details to be captured! 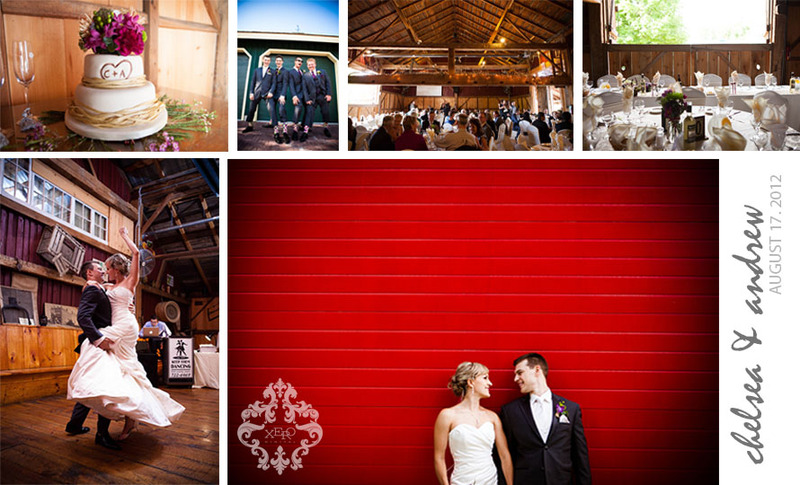 Jenny & Jeremy both grew up in different parts of Canada and they honoured that with their wooden plaque guest book, burned with their initials, the wedding date and the provinces they were born in. Jenny had Irish heather in the centre pieces and even a little model of their cat hiding underneath the wedding cake. It had rained all the night before and even though the tent was extremely muddy and the evening dropped in temperature, these two had a blast, they didn’t let anything bother them (even the mud on Jenny’s dress)! I think this was one of the most unique weddings we were able to shoot in 2012!